Annapurna Base Camp trek goes right through the centre of the Annapurna Sanctuary of the popular Annapurna region in western Nepal near Pokhara. It boasts mind-blowing views of the snow-capped peaks, Himalayan glaciers, dense forests including rhododendron. The cultural diversity is another tremendous side of this trek that passes through the Gurung, Thakali and Magar settlements each with their own unique cultures and traditions. 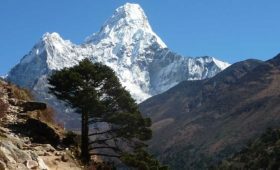 The Annapurna Base Camp trek provides three amazing spots to witness the Himalayas: Poonhill, Machhapuchchre Base Camp and the Annapurna Base Camp. 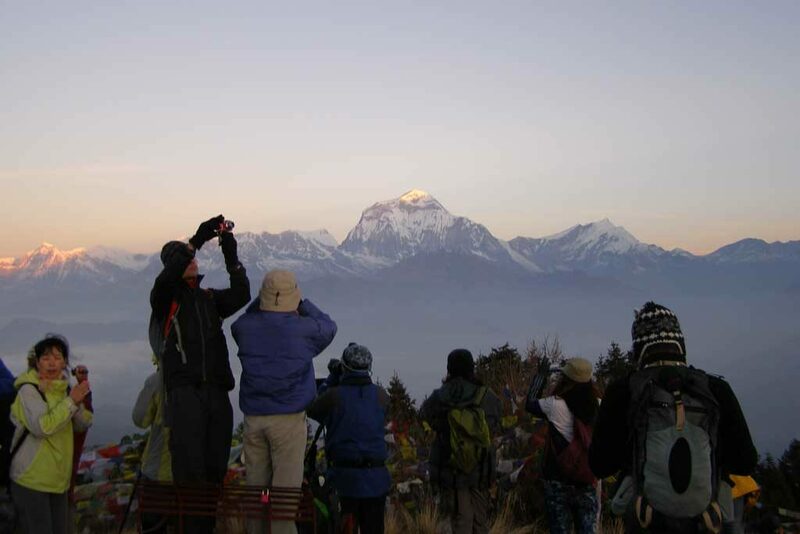 Trekkers get up early in the morning and proceed towards Poonhill with head lamps or torches in their hands in order to experience the magical sunrise over the Annapurna Himalayan Range. The famous Poonhill Ghorepani trek is the part of Annapurna Base Camp route for easy and short duration trekkers. While ascending further into the heart of the Annapurna Sanctuary, trekkers reach Machhapuchchre Base Camp (3,700m). The views are breath-taking and you can see Annapurna South (7,219m), Annapurna I (8,091m), Annapurna III (7,555m) and Machhapuchchre (6,997m). The trek further takes to the Annapurna Base Camp (4,130m) where you will be engulfed by magnificent panoramic views of the snow-capped peaks of Annapurnas. The Annapurna Base Camp trek requires a reasonable degree of fitness as it needs to walk about 6-6.5 hours on certain days. A moderately fit person with some previous hiking experience or an intense exercise class such as a spinning class will be suitable for the Annapurna Base Camp trek. Regular exercising or jugging will be really helpful for this trek. Perhaps now you are thinking of trekking to the Annapurna Base Camp. So, what to expect then? Being with an organised group makes a lot easier; they will arrange the necessary trekking permit, accommodation, guide and porter to carry your luggage. However, being a member of the big group or in a private group makes a big difference in cost. Obviously, private trips are more expensive than group treks. If you are thinking for longer and more challenging trek in the Annapurna region, then Annapurna Circuit trek is the right trip. This trek is available for three weeks and takes over 5,416 meters of Thorung La pass. How much does it cost for Annapurna Base Camp Trek? The cost of Annapurna Base Camp trek varies with different organizations. Here we are suggesting a reasonable price for Annapurna Base Camp trek for 11 days starting from Kathmandu and finally ending the trip in Kathmandu. However, compared to the popular Everest Base Camp trek, this is far cheaper because of the cost for transportation. The most expensive part of the Everest region trek is the flight for Kathmandu-Lukla-Kathmandu that costs over US $350 per person. So, the Cost of the ABC Trek: US $765 per person. [Day 01]: Drive or fly from Kathmandu to Pokhara (884m). [Day 02]: Drive from Pokhara to Nayapul then trek to Tikhedhunga (1,540m). [Day 03]: Trek from Tikhedhunga to Ghorepani (2,860m). [Day 04]: Early morning hike from Ghorepani to Poonhill (3,210m) then to Tadapani (2,650m). [Day 05]: Trek from Tadapani to Chhomrong (2,170m). [Day 06]: Continue trek from Chomrong to Dobhan (2,600m). [Day 07]: Trek Dobhan to Machhapuchhre Base Camp/MBC (3,700m). 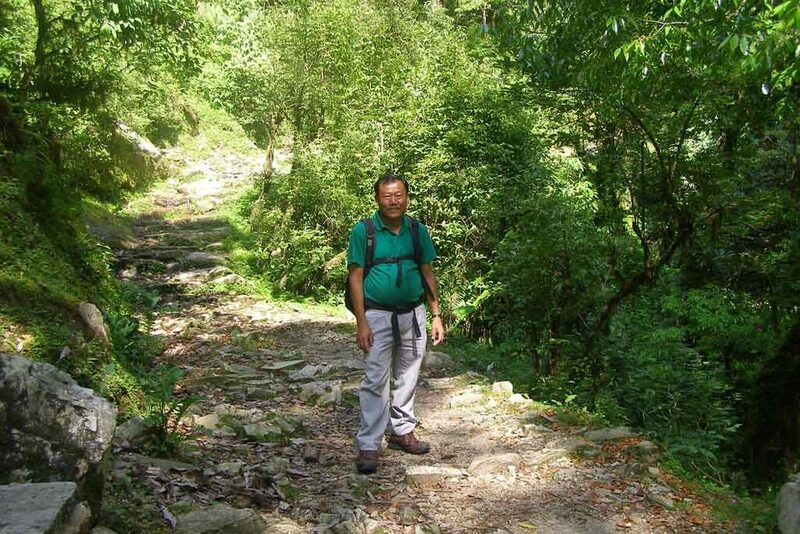 [Day 08]: Further trek from MBC to Annapurna Base Camp/ABC (4,130m) and return trek to Bamboo (2,310m). [Day 09]: Trek Bamboo to Jhinu Hot Spring (1,780m). [Day 10]: Then trek Jhinu to Nayapul (1,070m) and drive to Pokhara. [Day 11]: Drive from Pokhara to Kathmandu. You can also fly between Kathmandu and Pokhara. 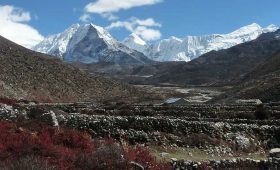 The best season considered for Annapurna Base Camp trek are during spring (March to mid May) and autumn (Sept to mid Nov). The days are sunny and warm yet the evenings are cool and can tumble to solidifying in higher elevations. However, trekking in early winter is also possible in favourable weather conditions. It can be very cold during winter. Some people even enjoy trekking in summer to the Base Camp of Annapurna. What equipment is needed for Annapurna Base Camp trek? 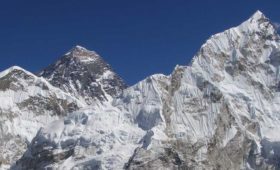 Our comprehensive Equipment List provides a top to bottom trekking and climbing equipment necessary for trips in Nepal. Not having proper equipment can be troublesome, eventually causing health hazards or just simply ruin your holiday. We have accumulated some of the frequently asked questions we received from our prospective trekkers to the Annapurna Base Camp. 1) What level of fitness is required for this trek? Annapurna Base Camp is medium-hard trekking trail. So, moderately fit people can do this trek. Previous hiking experience is not really necessary but will be an asset. 2) Can I hire some gears in Nepal? If you are not sure of what equipment to buy for Annapurna Base Camp trek, we have a complete guide on Equipment List. In fact, you can also buy or rent some trekking gears in Nepal. A sleeping bag is available on rental about $1 or less per day. 3) How long do we need to walk everyday while trekking to Annapurna Base Camp? You will need to walk about 4-6 hours each day. However, you have to make up your mind for 6-6.5 hours for some days. 4) What is the highest altitude of this trek? 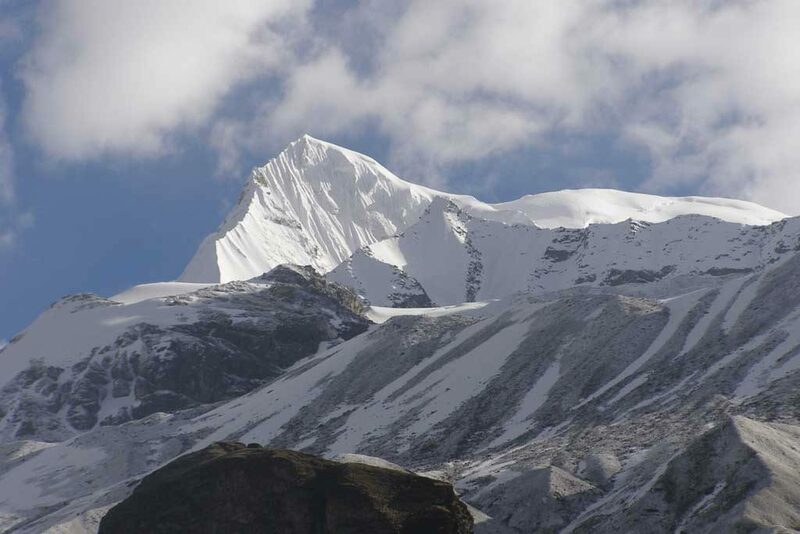 The maximum altitude of Annapurna Base Camp trek is 4,130 meters. 5) Is there internet access along the trek? There is internet access in most of the places. Guest houses or lodges may offer you wifi facilities on an additional cost. 6) Do they have hot shower facilities on this trek? Yes, there are hot shower facilities on this trek. The lodge owners will ask you to pay some amount about $1 to $3 depending on the remoteness of the trek. However, it could be available for free at lower elevations. 7) Can I charge my battery during the trek? You will have charging facilities while on the trek. Please note that you should bring your own charger and a universal electric power socket. How we make this trip Responsible? This is also an eco-friendly trekking trail. Hence Trekking Encounters promotes Responsible Tourism and strictly follows the responsible travel guide lines. Read more about Responsible Holidays. How to book this trek?